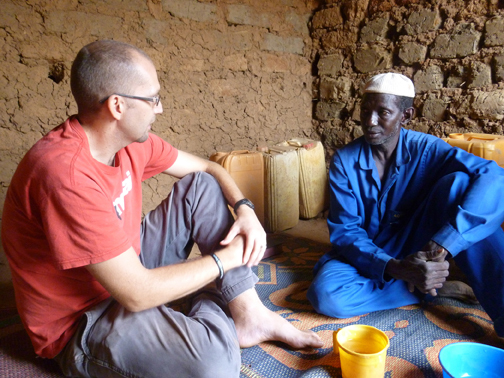 During July 2014, WKU Center for Water Resource Studies staff member and Department of Geography and Geology graduate student Jonathan (Joneo) Oglesby made his way back to Niger, West Africa, to continue his thesis research among the Songhai people. 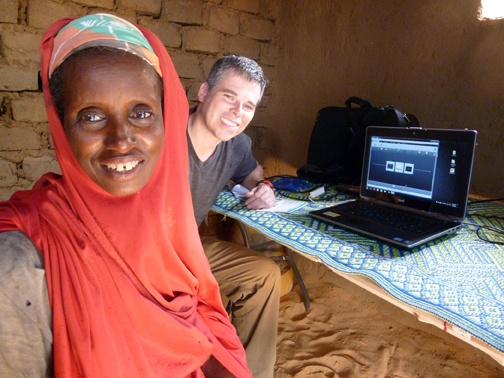 A Fulani woman in the village of Kakassi shared that she was taught by WKU graduate student Jonathan Oglesby during an earlier research trip to West Africa. This trip marked Oglesby’s fifth to the region and focused on the use of eye-tracking in the evaluation of image-driven water education, which utilizes cultural- and gender-appropriate images designed to foster visual storytelling. “When you have a cultural group who, for the most part, can’t read or write, information is passed through conversations and storytelling. I worked hard to use simplistic imagery in an effort to improve comprehension and recall of key concepts,” Oglesby said. Images developed for this research focus on water pollution, sanitation and hygiene protocols, and personal water-treatment techniques. Oglesby carried Tobii eye-tracking equipment used in the eye-tracking laboratory of Dr. Leslie North, Geography and Geology faculty member, to 12 rural villages, conducting a total of 464 eye-tracking trials and nearly 24 hours of recorded audio interviews. Eye tracking uses specialized equipment to measure and record quantitatively where a person’s eyes are looking, the order in which they look at an image, and how long an observer gazes upon areas of interest. The use of eye-tracking technology for this project allows for the collection of quantitative data about how West African culture groups view and interact with the newly developed water education materials. This is one of (and perhaps) the first studies of its kind to investigate effective visual learning design with eye-tracking in rural villages of Africa. Oglesby worked in bush maternity wards, medicinal depositories, and mud-brick homes during the research expedition. Nine culture groups were tested that included Songhai, Zerma, Hausa, Kutay, Gourmanche, Fulani, Kado, Mori and Tamachek. 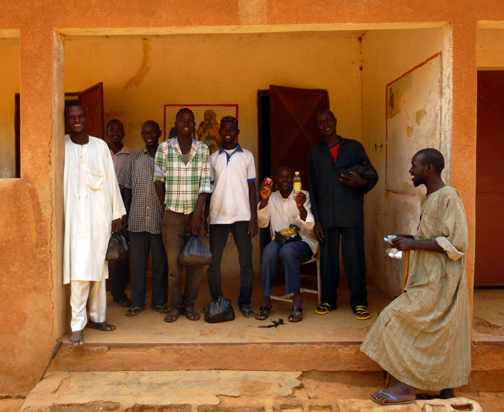 A group of Zerma and Fulani men showed the contents of their care packages they received after conducting eye-tracking trials in the village of Bassi. Each day, 33 children die from diarrhea caused by unsafe drinking water and improper sanitation in the West African country of Niger. More than 80 percent (14 million people) don’t have access to proper sanitation. Nearly 50 percent (8 million people) don’t have access to safe drinking water. Almost half of the country’s population lives in extreme poverty on less than US $1.25 per day. Seventy-one percent of the adult population (15 years and older) can’t read or write. By using science-driven water literacy visual communication techniques, Oglesby is striving not only to educate through the use of images, but also to contribute to the wider community about informal science education and visual learning. Mark Phillips translated Mounkaya’s thoughts and feelings about his water quality. Phillips, who lives in Niger, has been assisting WKU’s Jonathan Oglesby in his research project there. The team spent a total of US $12 on materials that included 16 1.5 liter clear plastic bottles for $1.50, one funnel for $1, five bricks for $4, one 4’ x 4’ sheet of reflective metal for $3.50, and two 25-liter “Jerry Cans” for water fetching and storage for $2. By buying local materials, they helped five small businesses. But the ability to empower a group of individuals with education and materials to perform their own solar disinfection proved priceless. For information about this research project or eye-tracking, contact Jonathan Oglesby at jonathan.oglesby@wku.edu or Dr. Leslie North at leslie.north@wku.edu. Oglesby also has created a non-profit organization called Fofo Hari to continue his work in the region even after the research portion is complete. Visit www.fofohari.org to learn more.